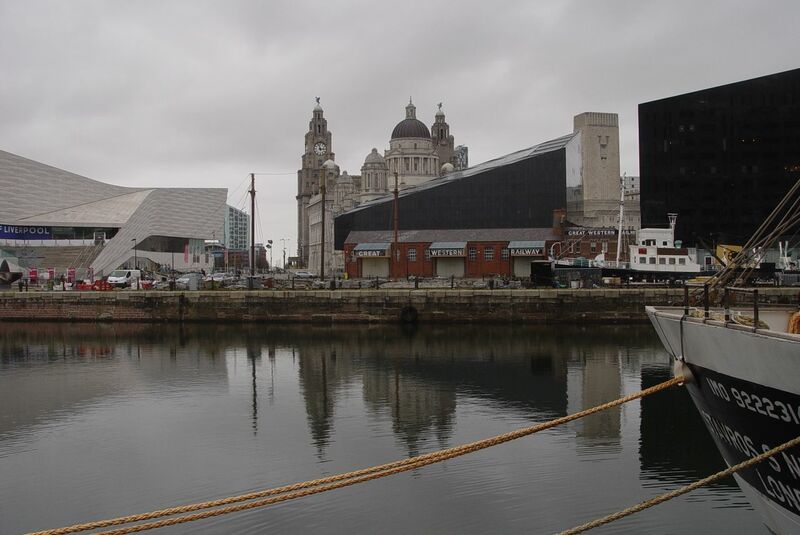 Exploring the Liverpool Docks, what remains and what’s been created from them, from Dingle to the centre of the city. Continuing this week’s Friday walk, then. Descending the Dockers’ Steps from the streets of the Dingle. 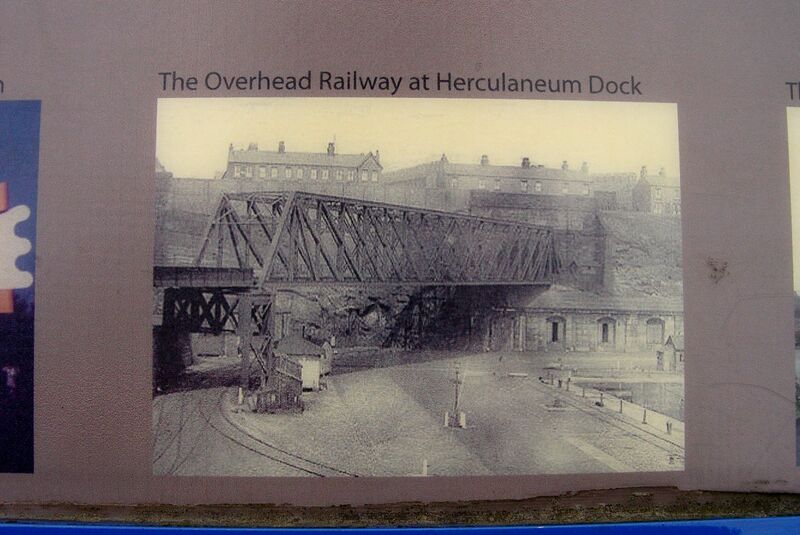 Passing what used to be the Herculaneum Dock. Navigating the walk with O.S. maps from the beginning of the 20th Century. This information point by the river showing what Herculaneum used to look like. A historic photograph this one. 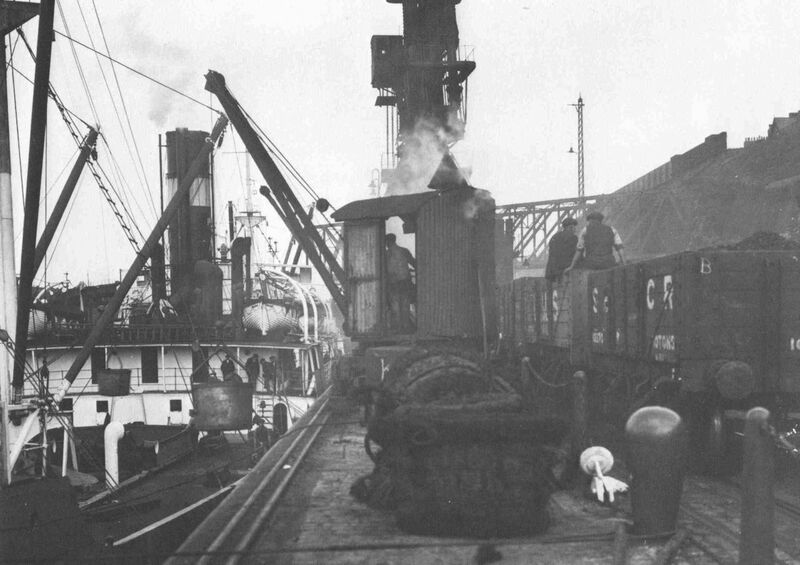 Normally coal was exported from Liverpool, but here coal is being unloaded from the ship directly onto the waiting rail wagons at the quayside. The Miner’s Strike is on and will soon lead to the General Strike. So not the proudest episode in Liverpool’s history, this one. 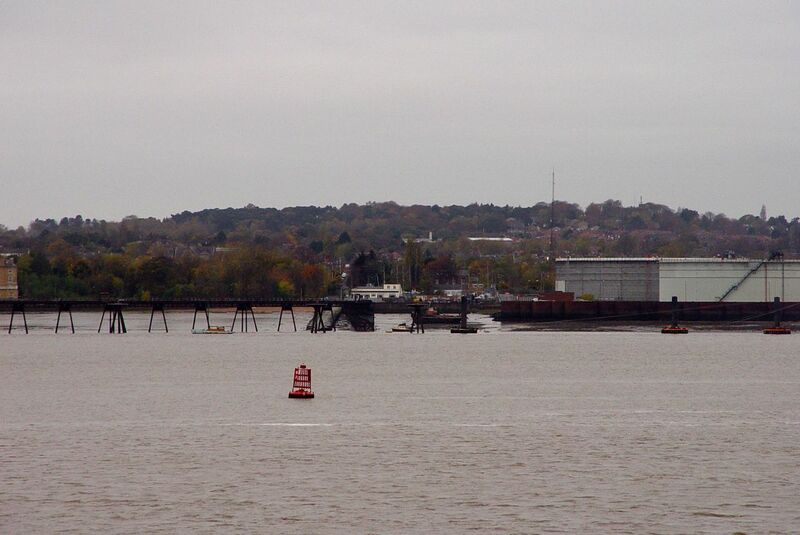 Across the river is Rock Park and the Tranmere Oil Terminal. 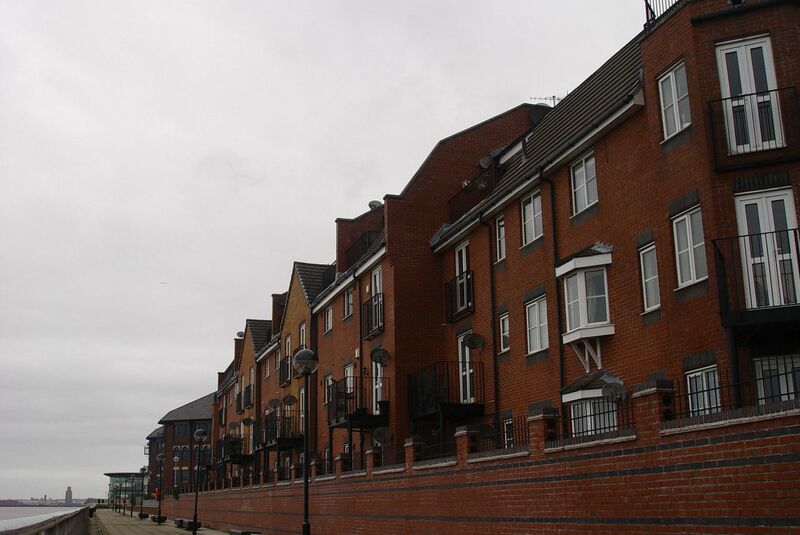 This side, new apartments look out on the river. Soon we get to here. 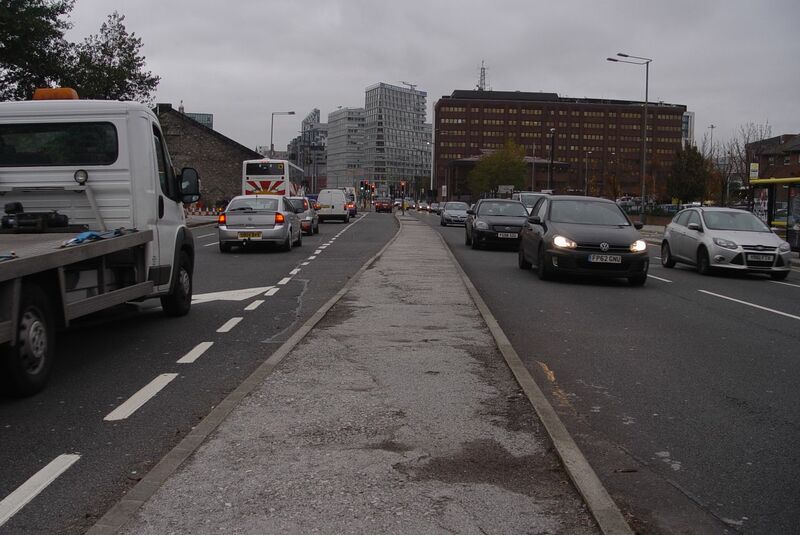 Where the Liverpool Overhead Railway used to emerge from that tunnel, until it was demolished in 1957. Where the Herculaneum entered the river stands this Chinese restaurant, the Chung Ku. The circular design fitting the space they had to build on. See exactly where it is on the map above. And this, incomplete for years. 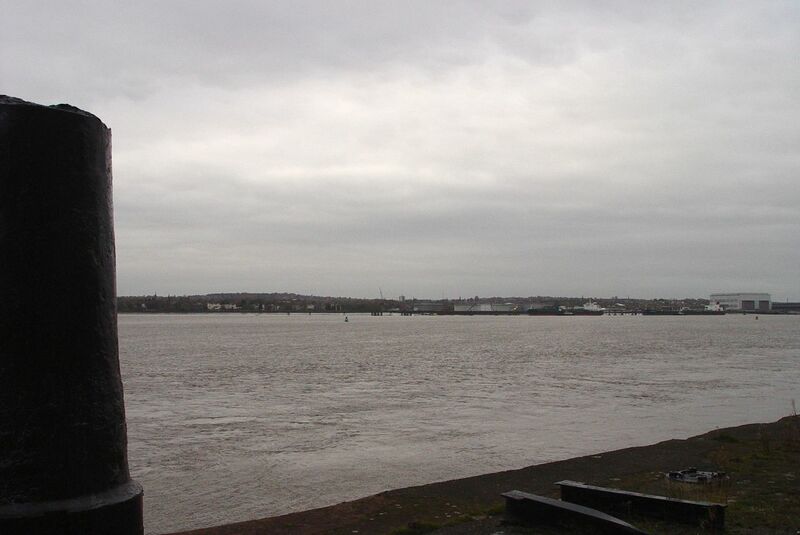 Across the river, in white, The Refreshment Rooms at Rock Ferry. 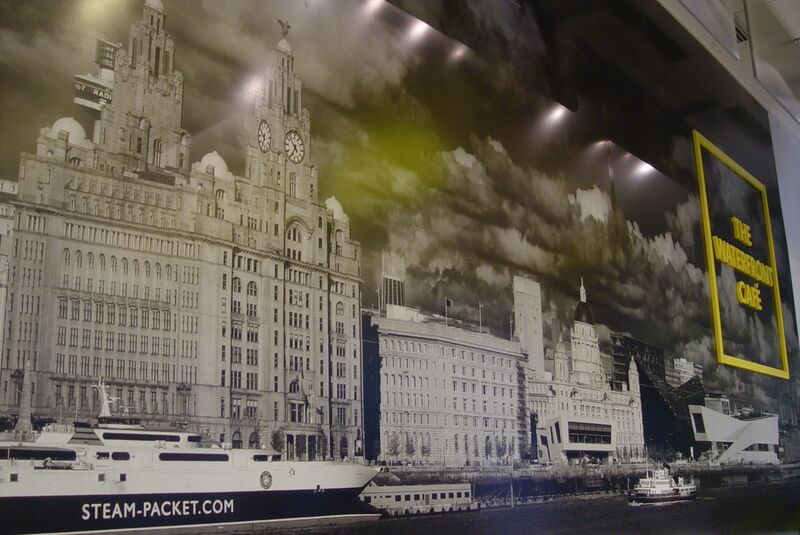 To Harrington and Toxteth Docks. 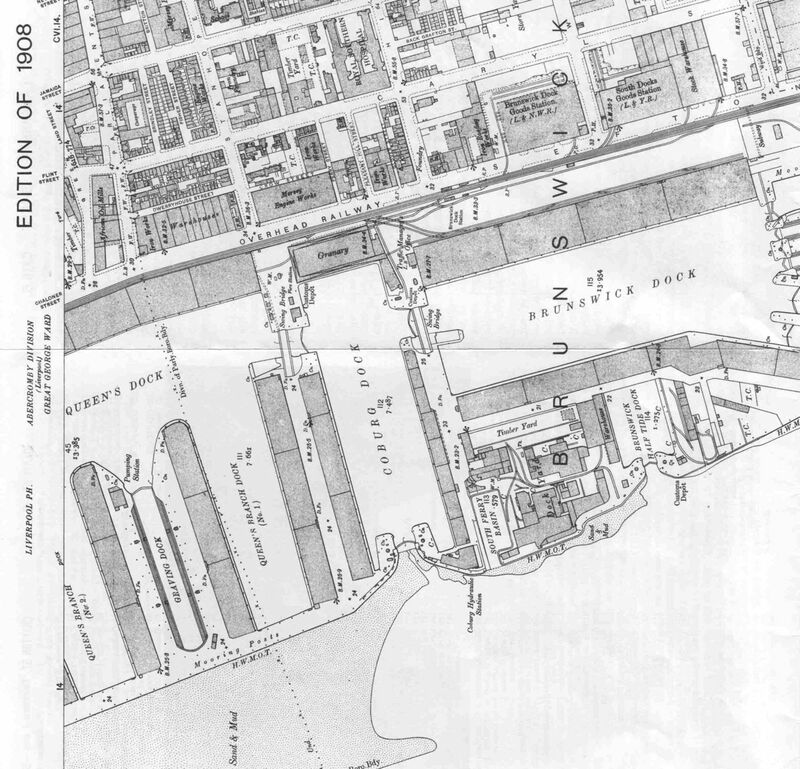 Here we coincide with my earliest memory of the South docks. It’s the mid-1960s and up in North Liverpool we’ve just got a car. One of these, blue too. ELV 397C. And at the weekends we go out for drives in it. Not to the seaside like the family in this advert, but more interesting places, closer to home. I remember going to see Skelmersdale New Town being carved out of the countryside. 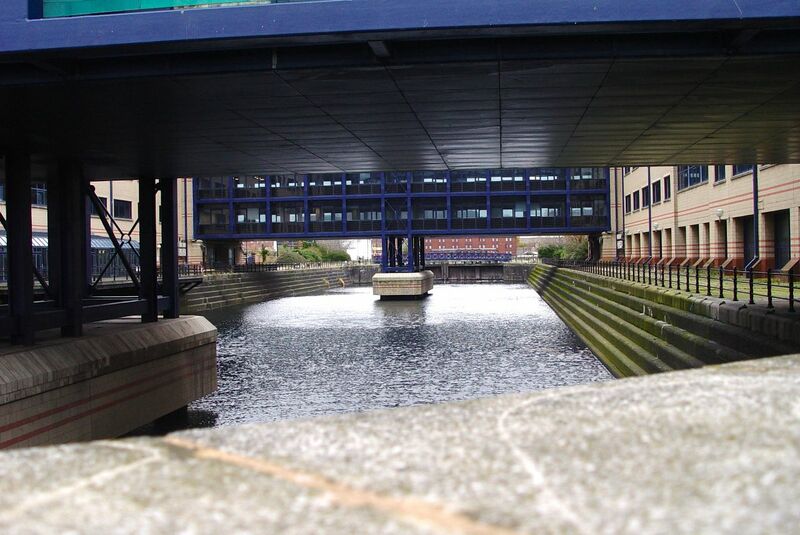 And we’d often go exploring in the North Docks, next to where our Dad was born. 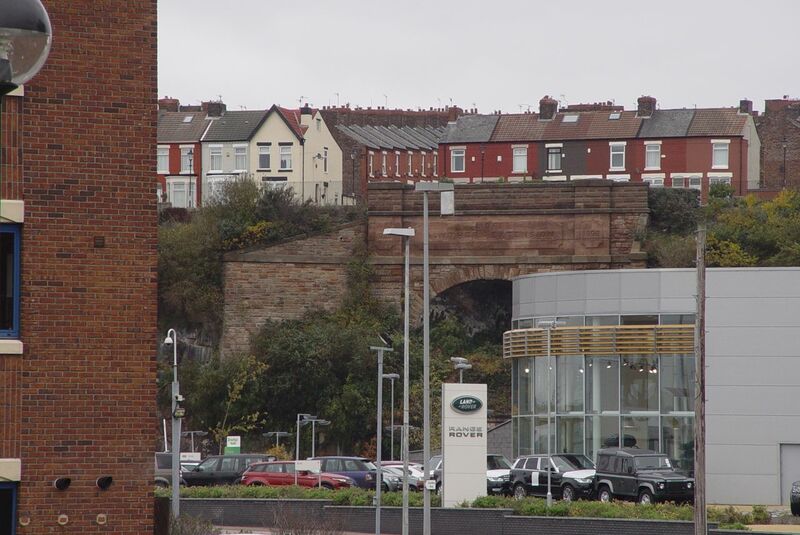 We’d always come along the North Dock Road driving into town. So we drove on and he showed us the South Docks, all pretty well closed up by then. So, like driving through a ghost town of huge warehouses and some glorious architecture. 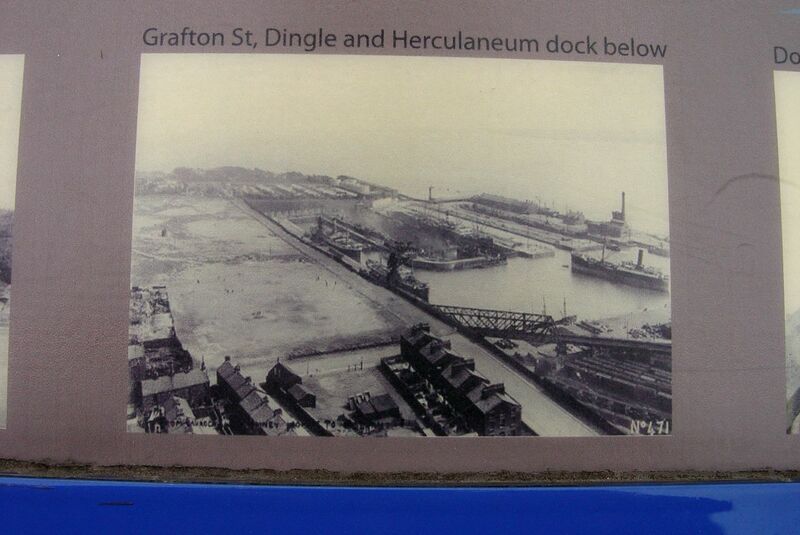 Most of the warehouses are gone now, but one construction particularly stuck in my memory, at just about where the South Docks Road ended in those days, to enter the Herculaneum Dock. And it’s still here. ‘Yes’ I hope I hear you saying. 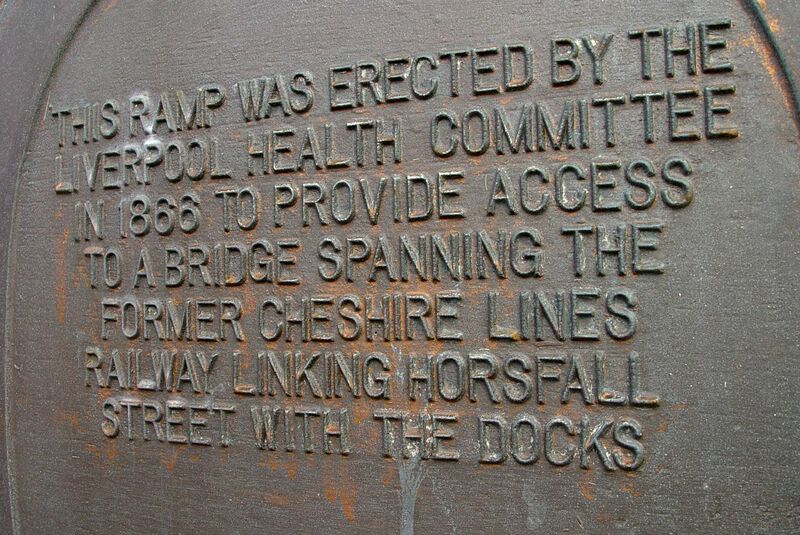 ‘But what is it?’ Well it’s the Horsfall Street Ramp of course (You can see it clearly in the right centre of the above map). I’ll let it explain itself. 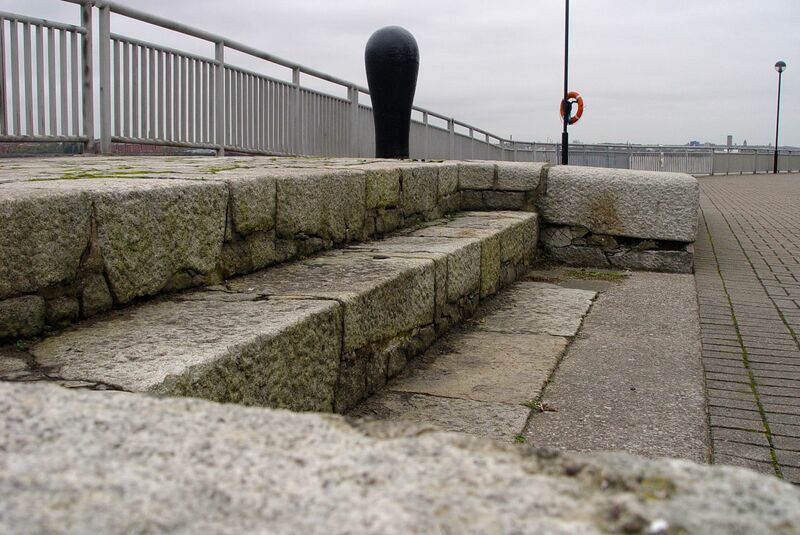 Another set of Dockers’ Steps then really. 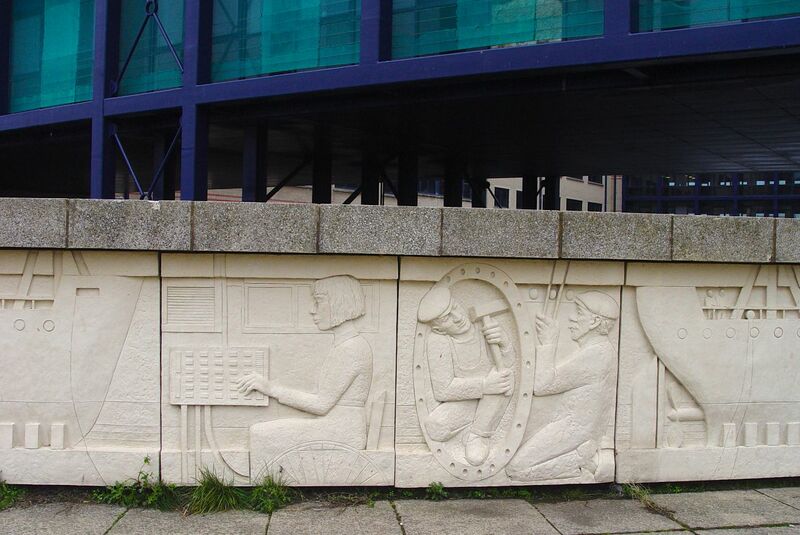 To enable the mostly casual dock labour force to get from home to the dock gates to queue for work, as they had to every day. And you’ll see on the photo above the sign that the Health Committee have thought of the health of animals too. There’s a horse trough at the centre and two little dog bowls either side for the animals to drink from. 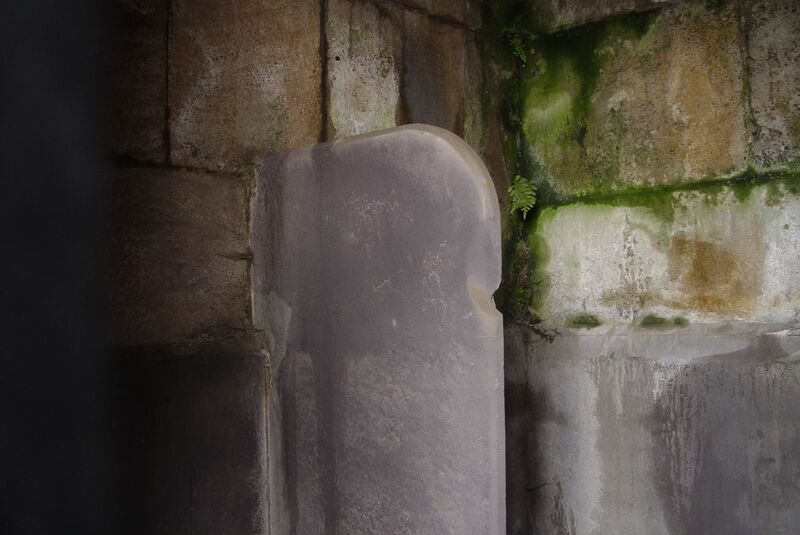 And those sentinel shapes either side? 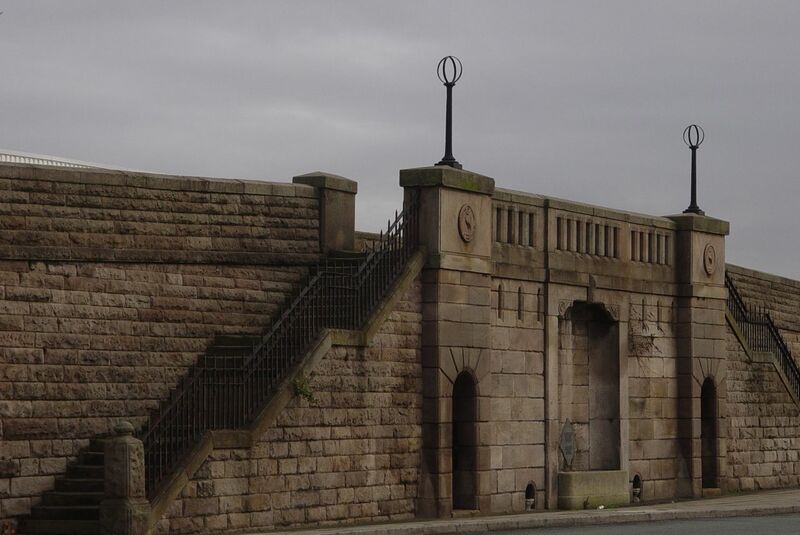 Across the Dock Road from here are the Harrington and Toxteth Docks. 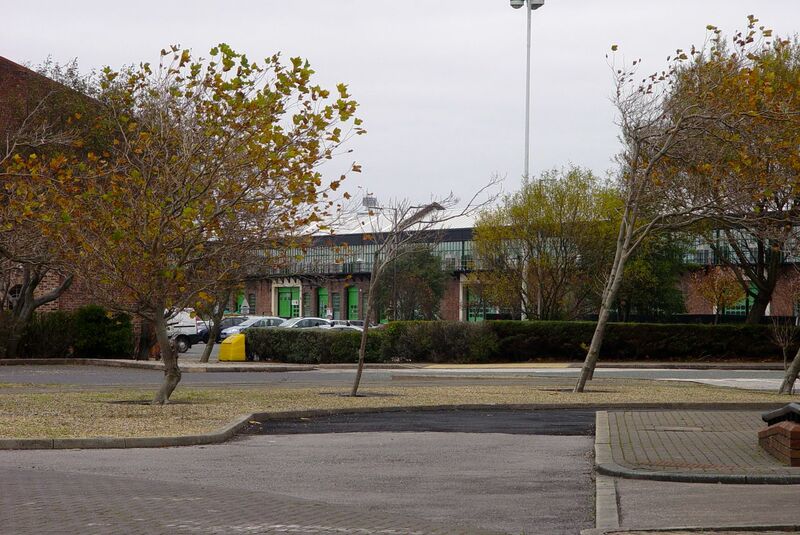 Occupied by a variety of businesses since being regenerated in the late 1980s. The docks filled in for car parking. Here’s how they looked in 1953. From the Liverpool City Council Yearbook. 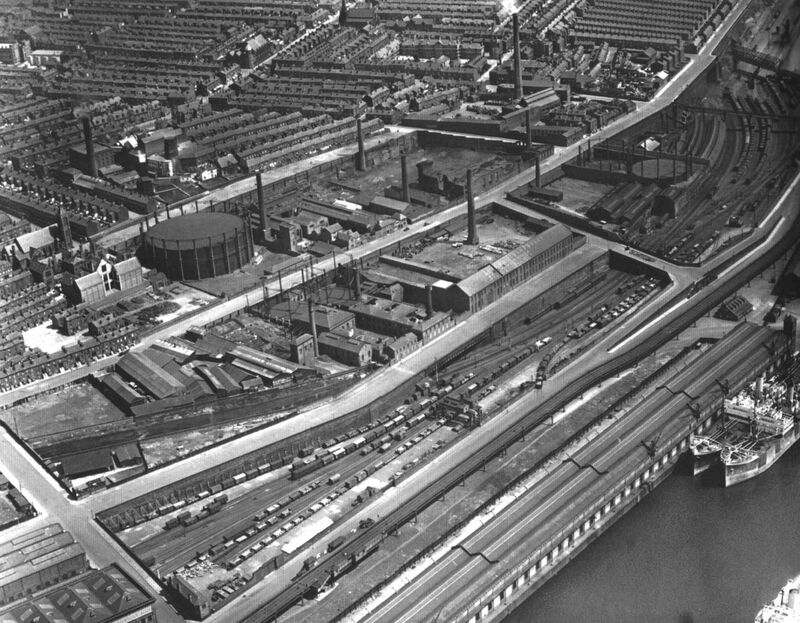 An aerial view from the 1920s or 30s. 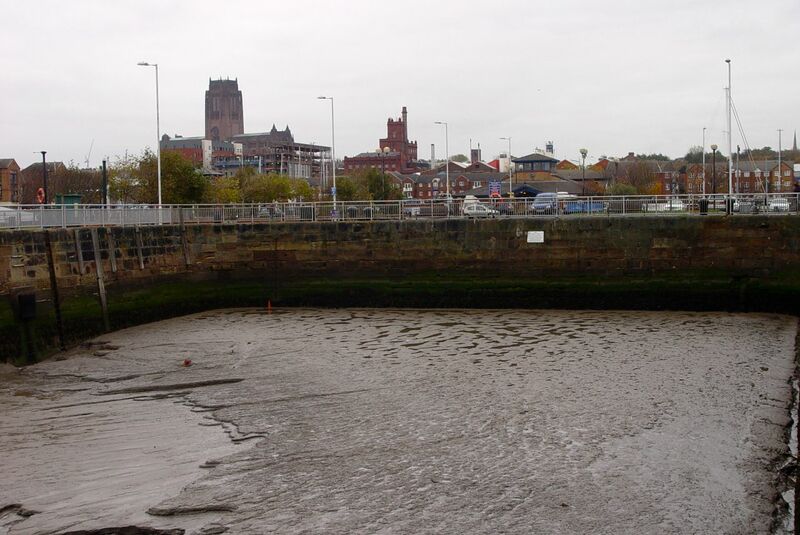 Toxteth Dock in the bottom right corner. 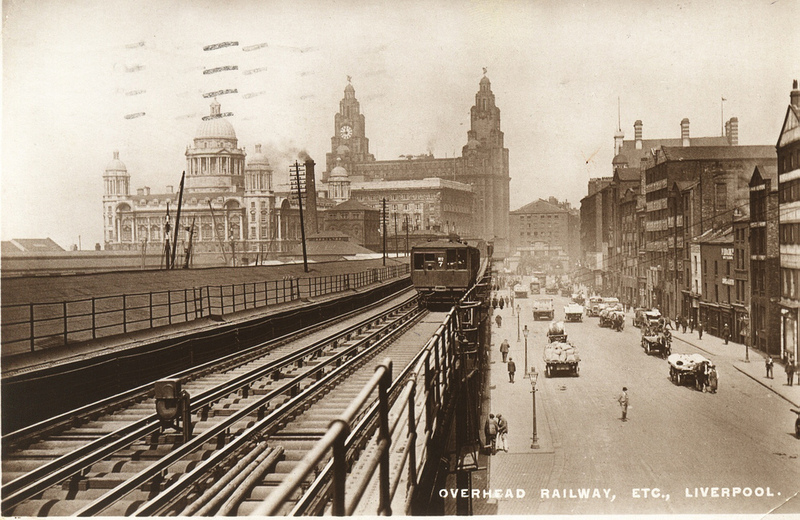 The Overhead railway running alongside it. 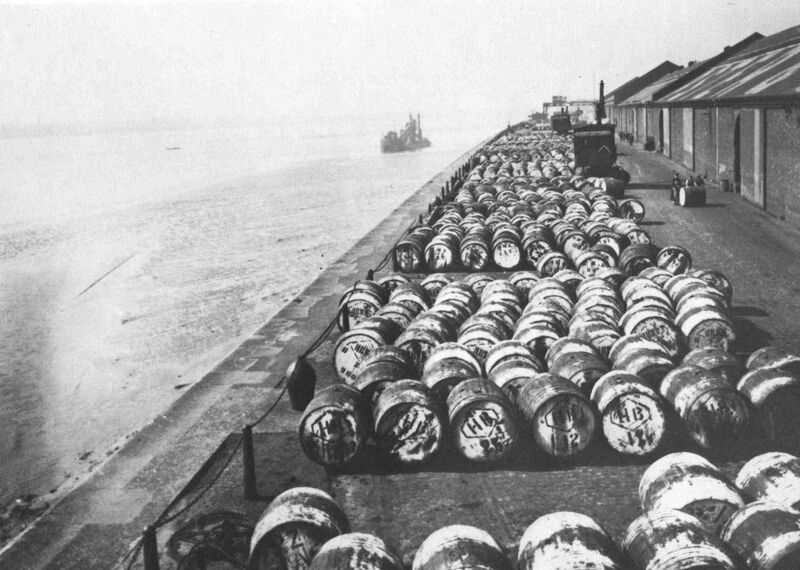 On the river side of the Toxteth dock, May 1922. Casks of Palm Oil. 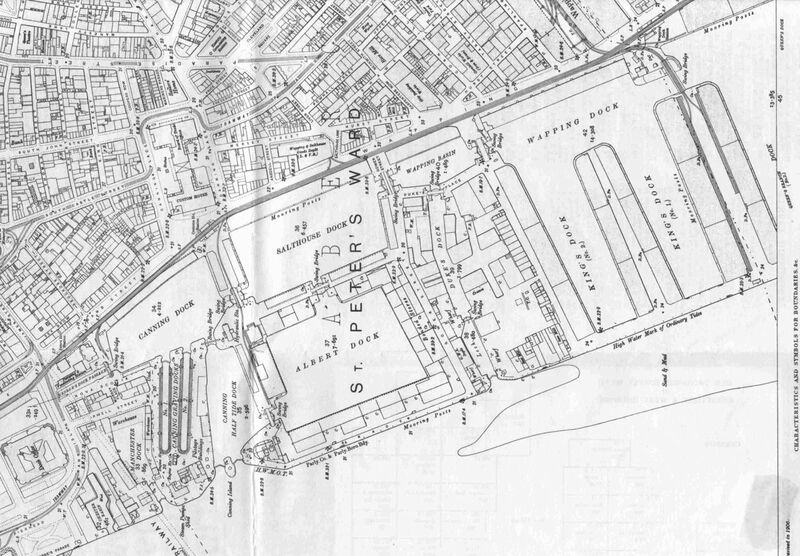 Toxteth Dock was particularly worked by the Elder Dempster Line, trading with West Africa. 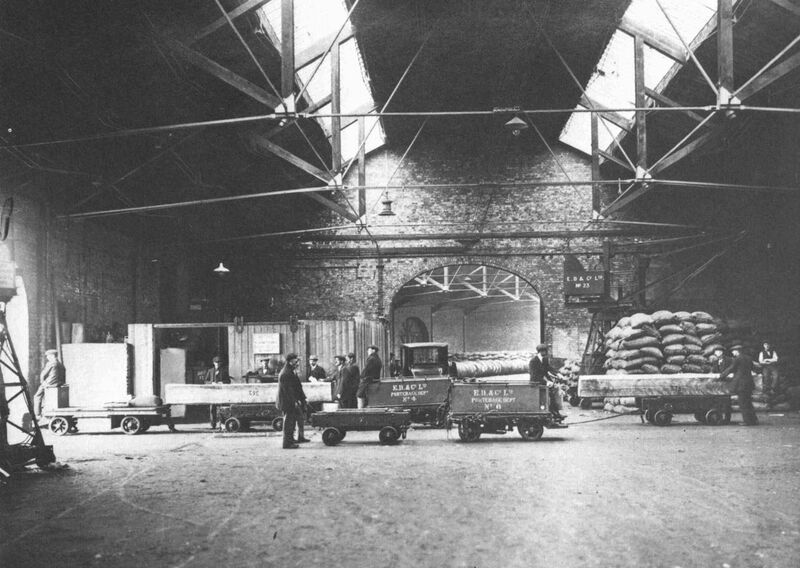 Inside the Toxteth Dock in the 1920s. A scene fairly familiar to me and Sarah as we did a lot of work in here, in the early days of ‘a sense of place’ around the turn of the 20th century, with the social enterprise Furniture Resource Centre. Who are still here, FRC Group. Walking on, Brunswick Dock and beyond. 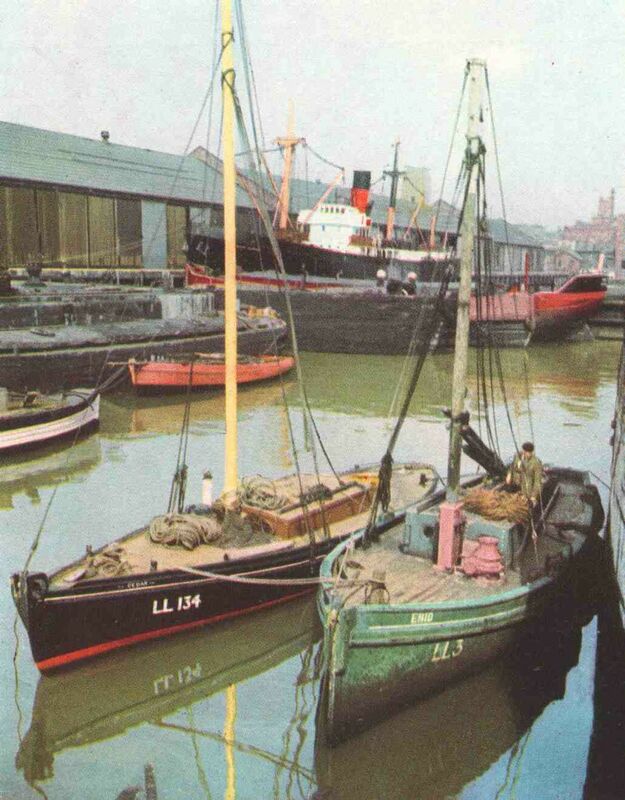 Brunswick Dock Gates in the early 1960s. So imagine the immensity of the work that’s gone on in the years since, to create what we see today. 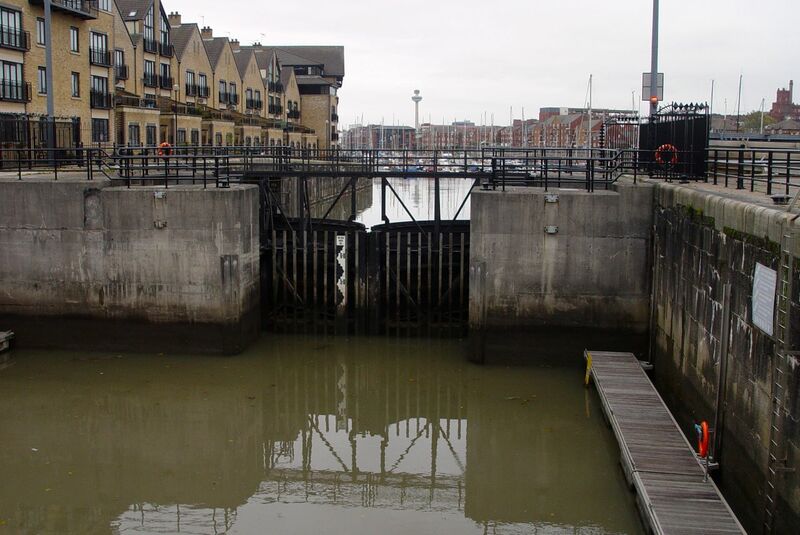 Inside the lock and the marina beyond. I remember coming to see the works on the Brunswick being done in the early 1980s. 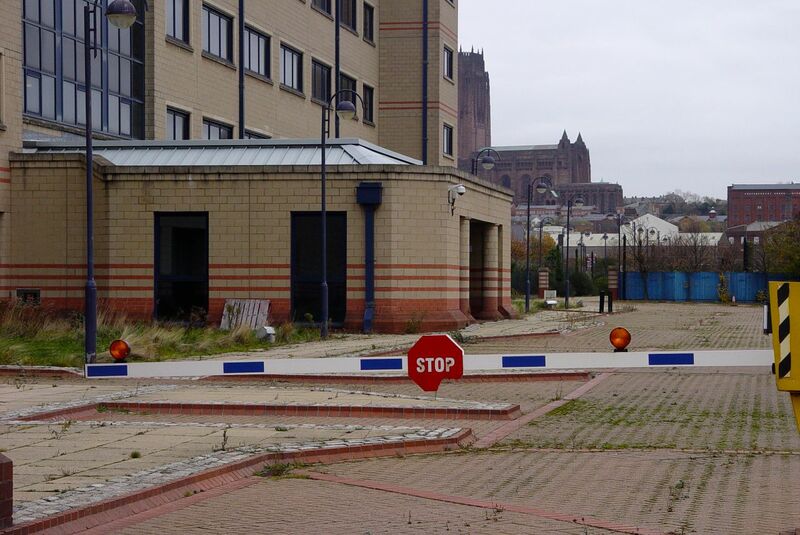 The place I worked for then, Liverpool Housing Trust, was involved in some of the works to the pathways on the riverside. I remember many of us objecting on principle as this wasn’t ‘anything to do with housing.’ Well I’m glad it was done now, glad to have been a small part of the miracle. 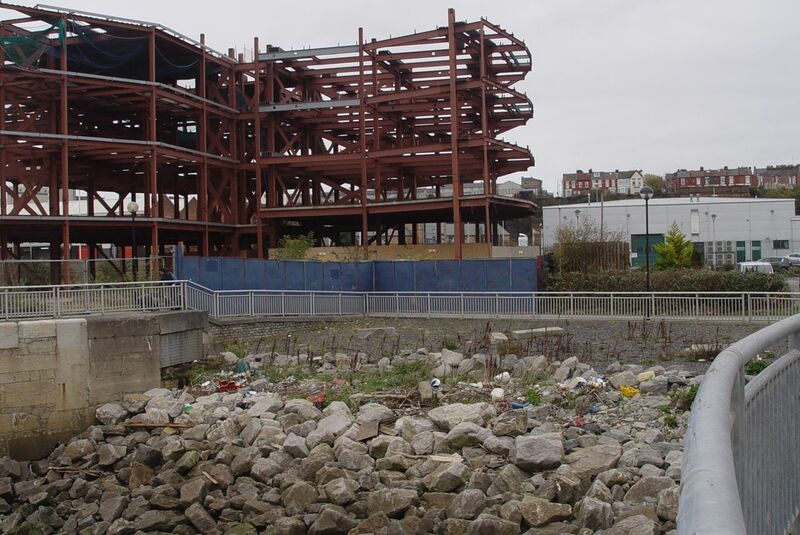 The first of the new buildings at the Brunswick we were shown that day has gone now. 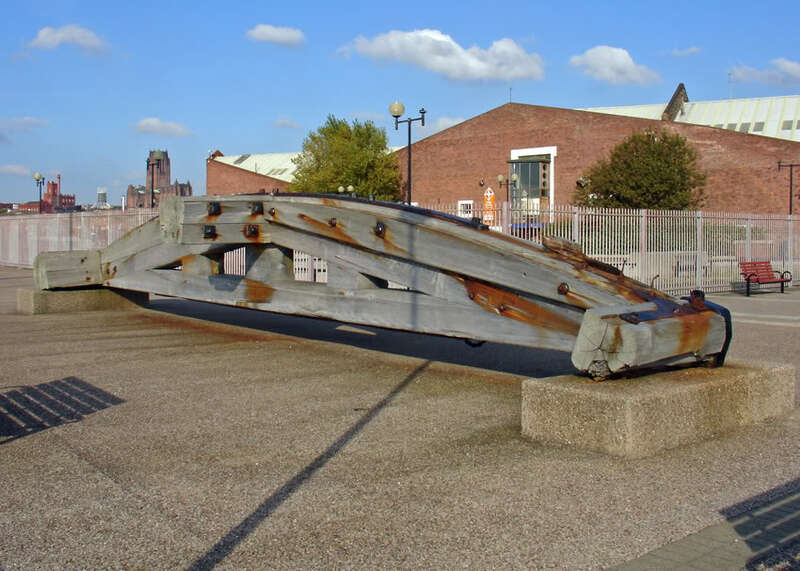 Seen here behind a piece of antique swing-bridge, the now demolished Brunswick Dock building. I’m not sure why it was demolished, because it hasn’t been replaced. Walking on, wonderfully, there are ghosts in the pavement. Rails of the dockyard railway at Brunswick. Where the Brunswick Half Tide Dock was. The craft in the background are on trailers, not in the water. This dock’s been filled in. 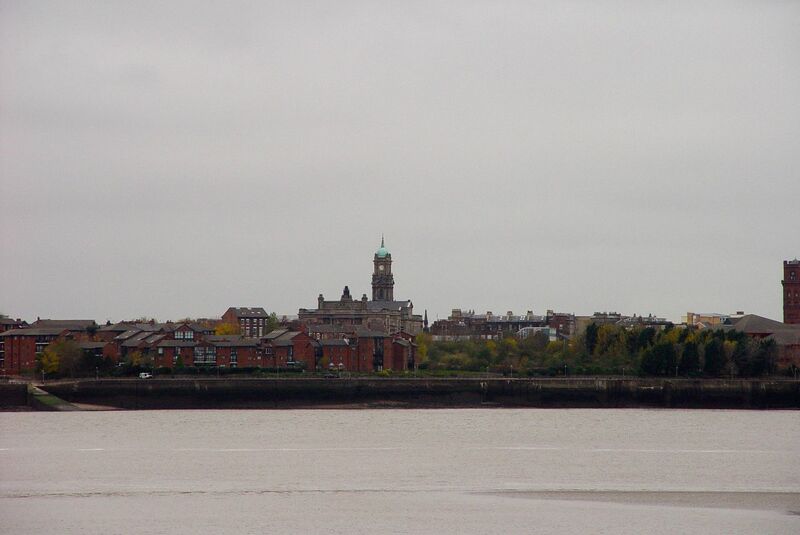 Over the water from here is Hamilton Square, Birkenhead Town Hall. The ‘Sand & Mud’ marked on the above map clearly visible. 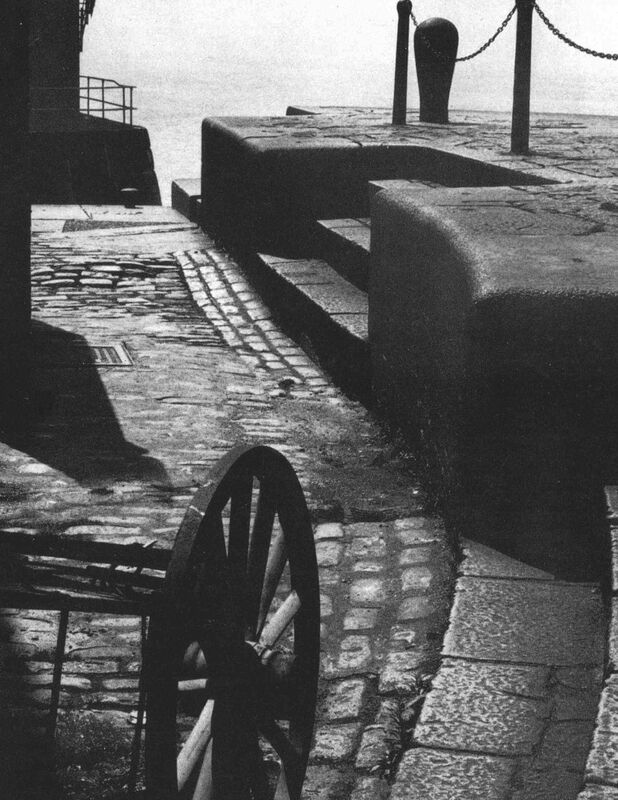 Steps and dock furniture photographed in 1963. Still with us today, 50 years later. Getting close to the city centre now. 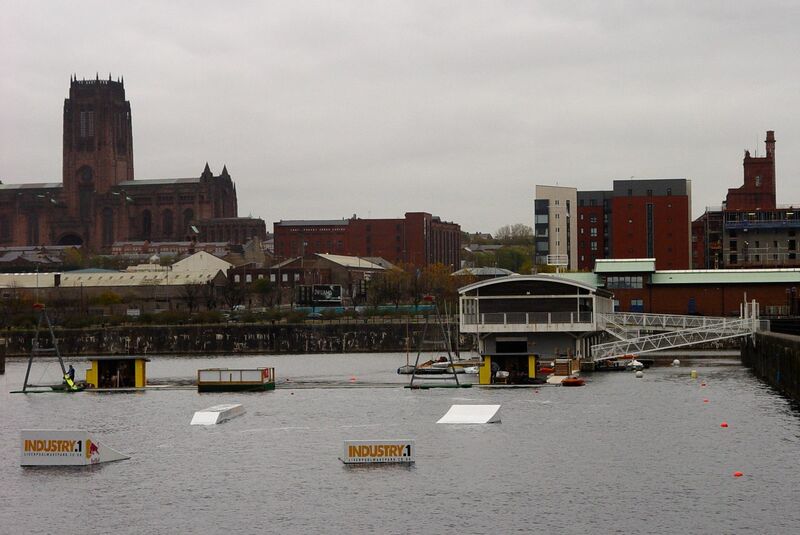 The docks filling up with their modern day activities. 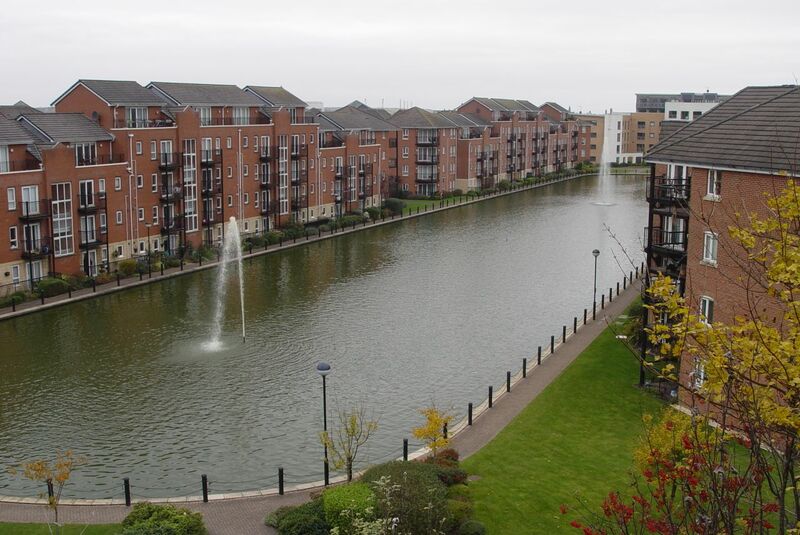 And people living where the warehouses and cranes used to be. 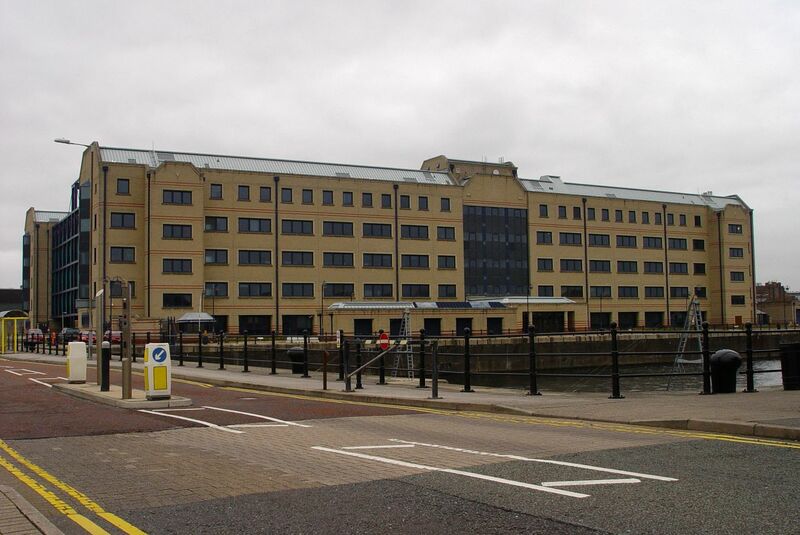 Queen’s Branch Dock (No. 1). 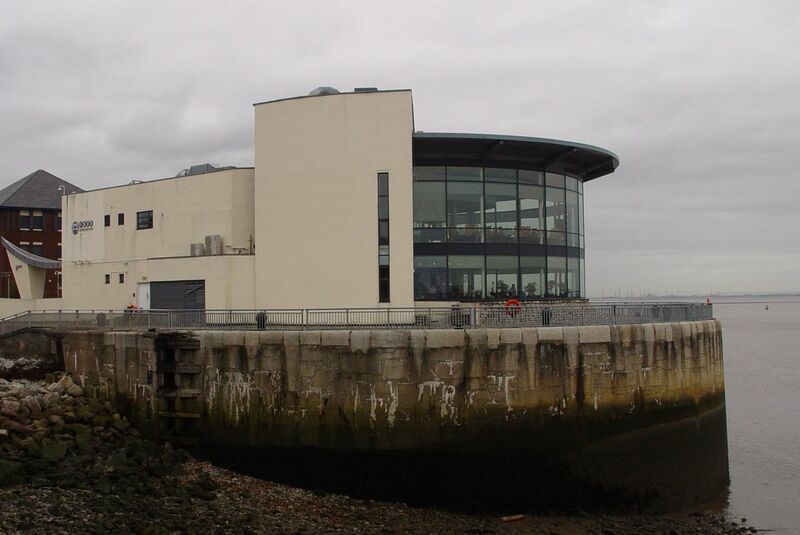 Here passing the Liverpool Watersports Centre where Sarah spent a lot of time a few years back Dragon Boating. 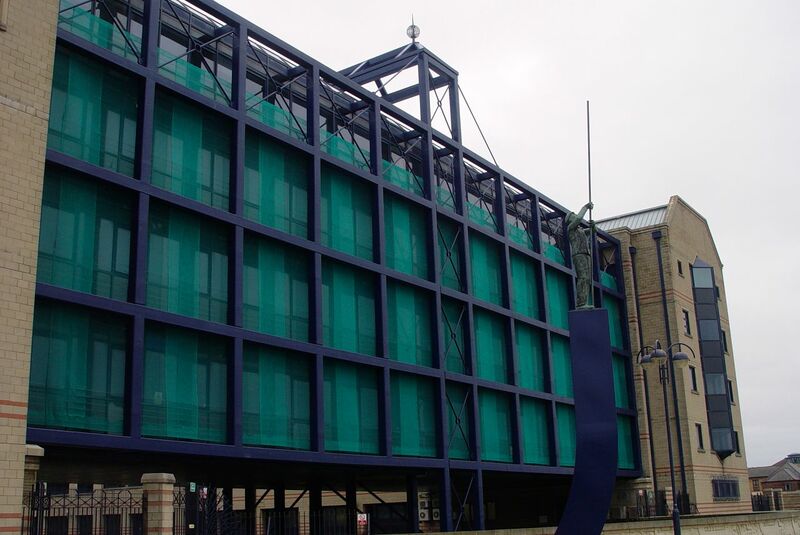 Regardless of its purpose and grateful for the local jobs, I’ve always thought this was a monumentally ugly thing to go and build. Well now it’s a shut down monumentally ugly thing. 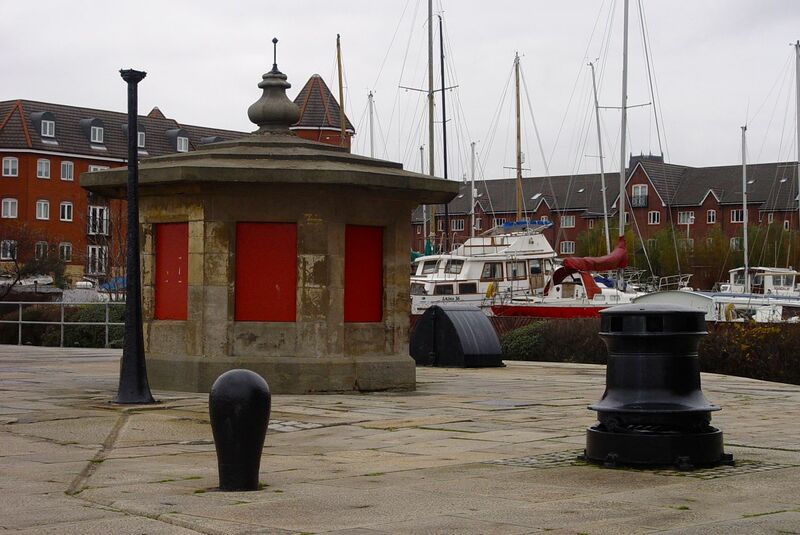 Perhaps it was unwise to build it on top of the Queen’s Dock Graving Dock? Walking into the city centre with one of our 1908 maps. 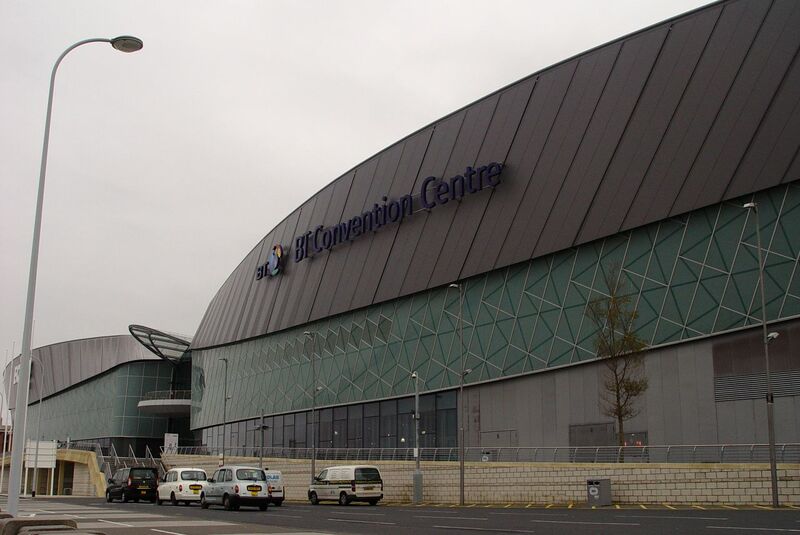 Passing the BT Conference Centre and the Echo Arena. 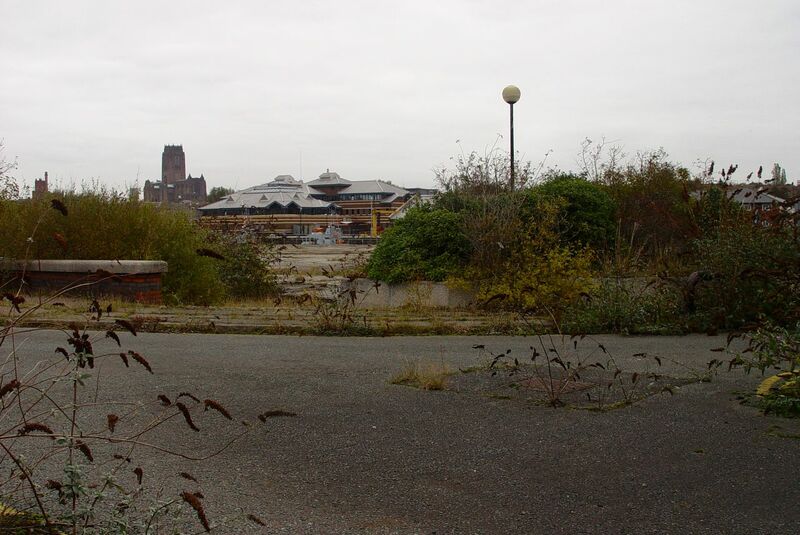 Before these were built, here at the mostly filled in King’s Docks (Nos 1 & 2) this was a proposed site for a new ground for Everton FC. Before that, in June 1990, I came here to see Paul and Linda. 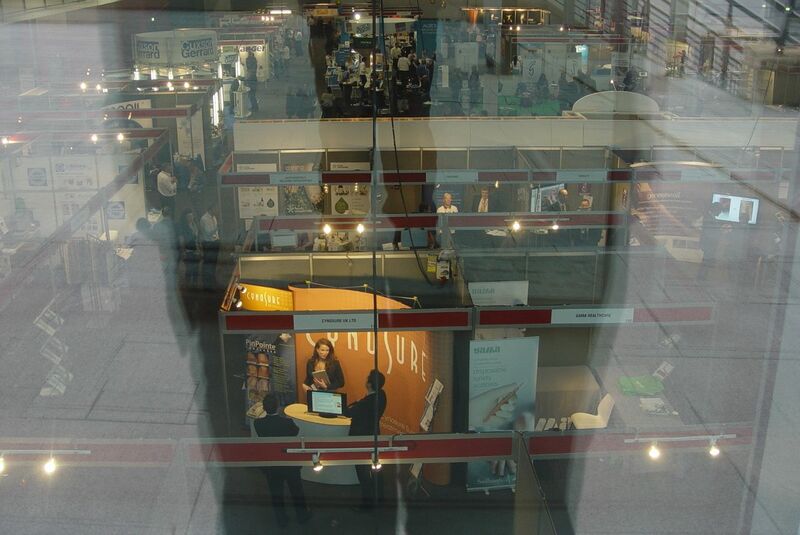 So, what’s on today in the conference centre? I press my nose up against the window. It’s like looking down into a parallel universe. 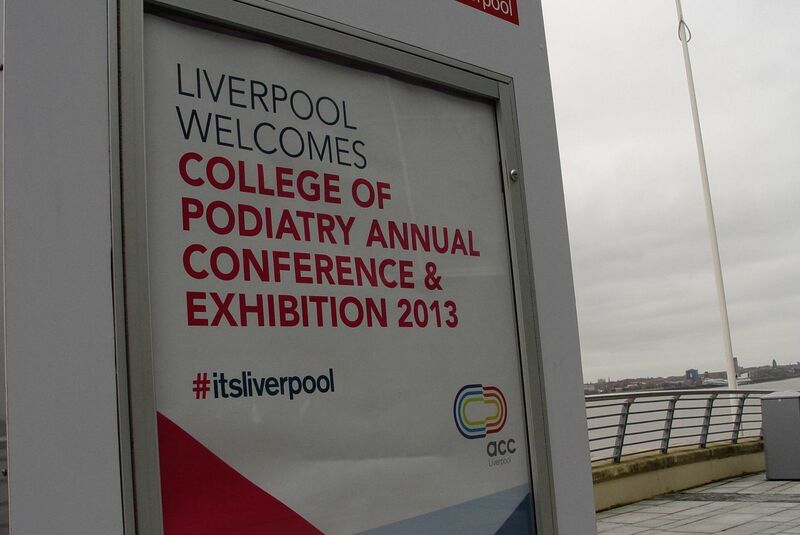 A conference about feet? 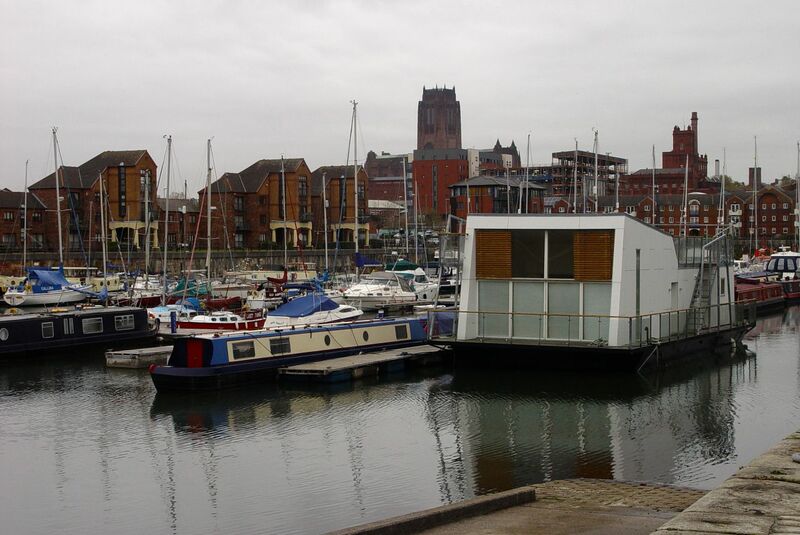 Our South Docks walk reaches the Albert Dock. I hardly ever come here. And actually, I’ve only come today for a wee. 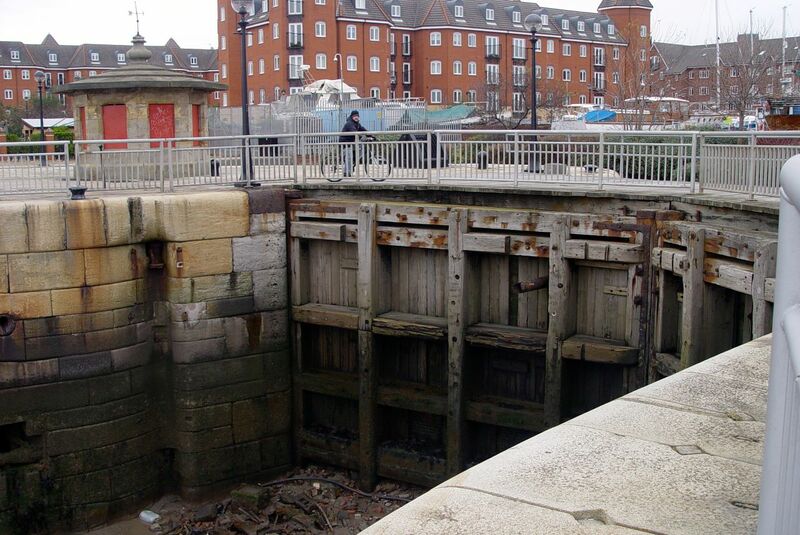 But it is a magnificent piece of regeneration. 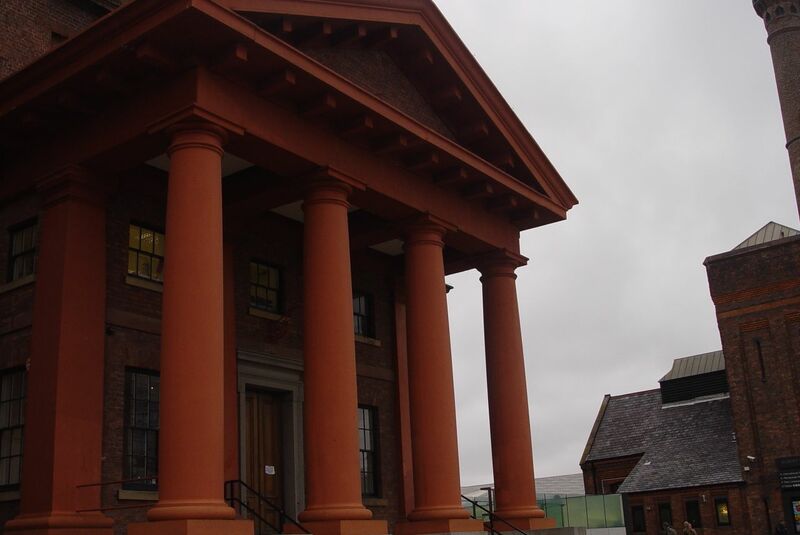 In fact I’m going to write a special post about what happened here and just next to it, at Duke’s Dock, where we lost one of the most beautiful buildings even Liverpool, a city packed with beautiful buildings, has ever seen. That will be soon. For today it’s time to walk on. Past the Dock Traffic Office. 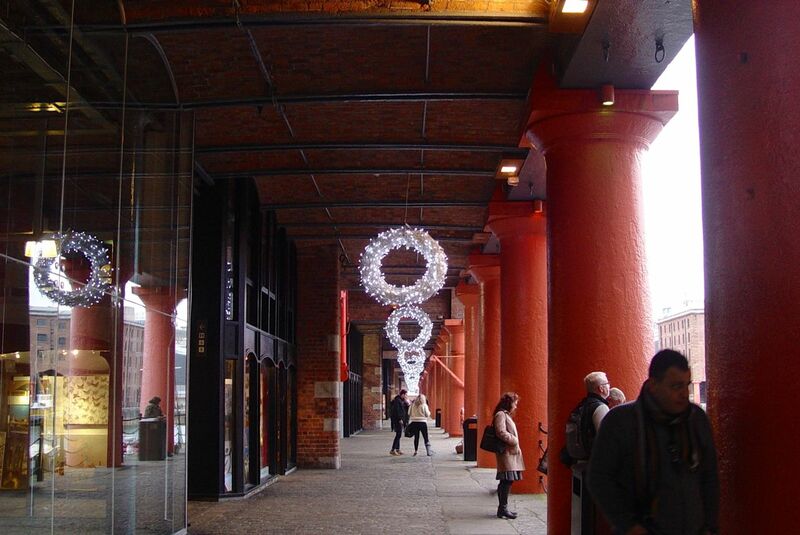 When the Albert Dock was first regenerated this was home for a time to Granada TV. 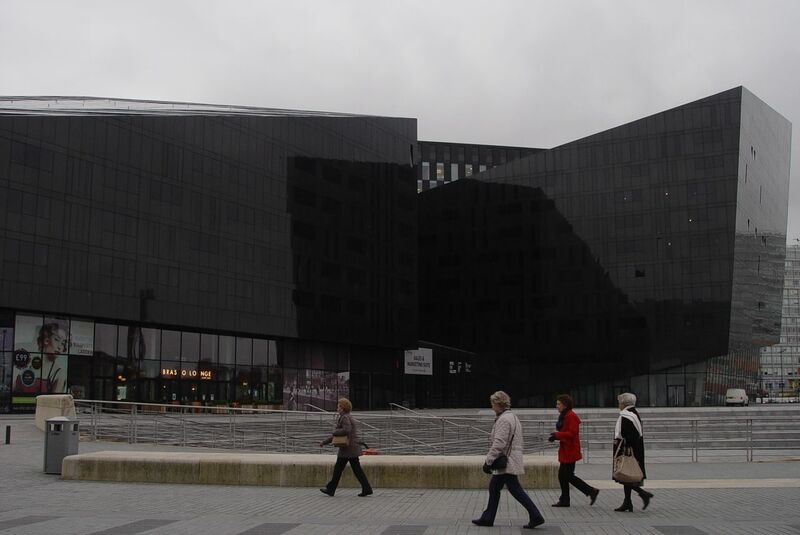 Empty, by now it was supposed to have been a splendid new entrance to the International Slavery Museum. Before the UK Government decided that austerity was a good idea. 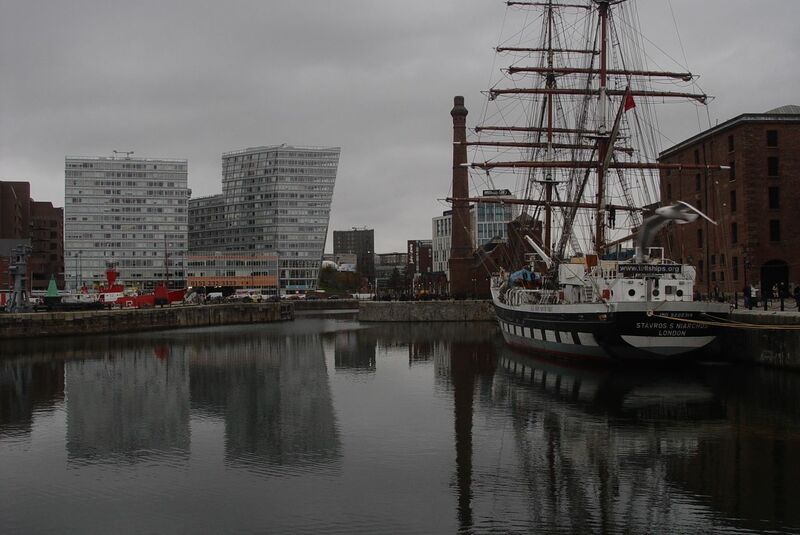 Looking across to Liverpool One, built on top of Liverpool’s original 18th century dock. 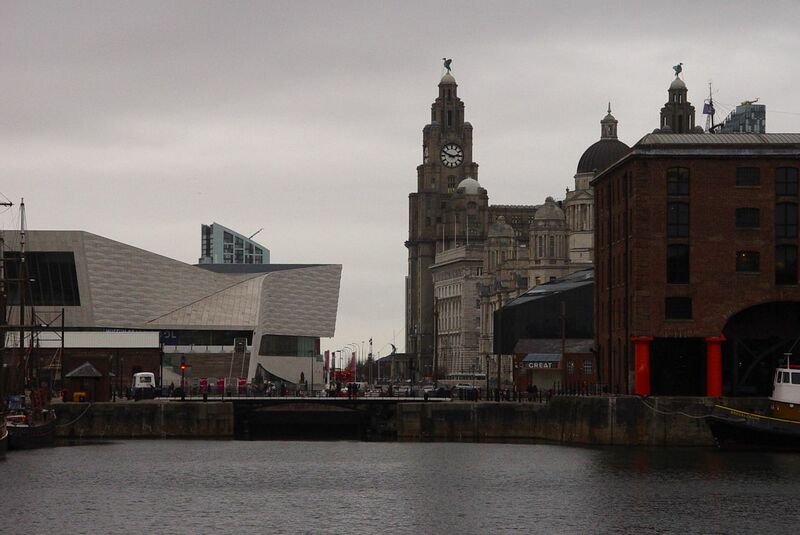 Cold now, with evening coming on, I decide to go into the café at the Museum of Liverpool, on the left there. Called the ‘Waterfront Café.’ Impressive location. Except for no doubt sound economic reasons it’s, erm, not on the waterfront. And it looks out on these brutalist and, in the scheme of all we’ve walked through today, surely temporary visitors to our docklands. Time to go home. And having walked with the old maps in my head for so much of the day I realise how much I still long to go most of the way back home on the Overhead. Well I can’t. But I know where to find some pieces of it. 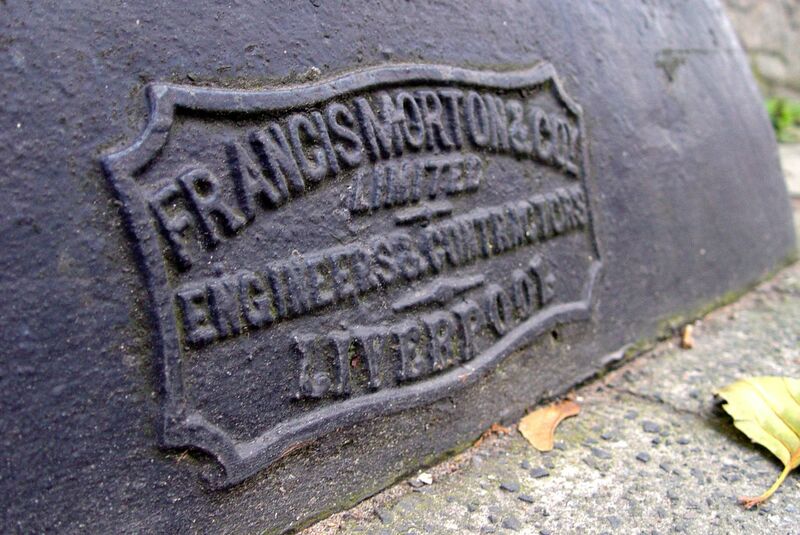 In the wall of Wapping Dock, just back along the road from the Albert Dock. 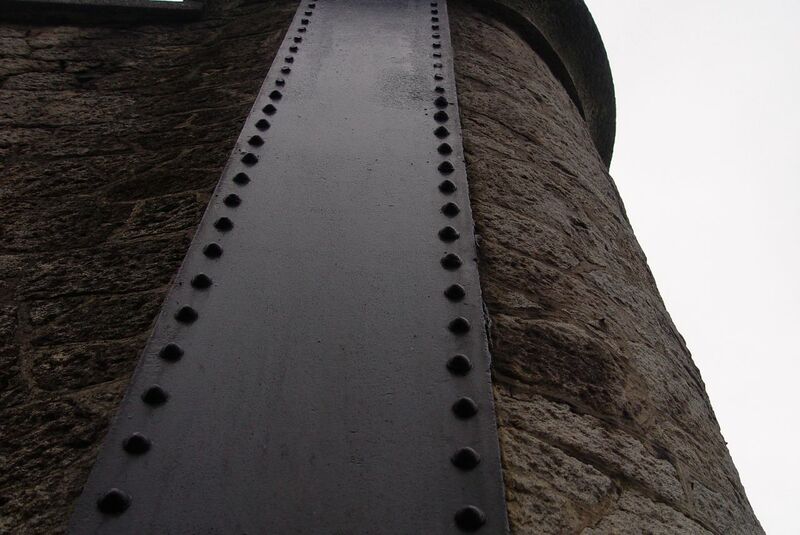 They did the ironwork for the Liverpool Overhead Railway. Here it is, rising up the dock wall to support the miracle we lost. I walk along where it was. To get the bus home. I make no apologies for this long post. View it as a short book. This was a great walk in a beautiful place that needs celebrating. We might not like everything that’s been built along the miles of the South Docks, but as I’ve said the miracle is that the places we have are there at all. 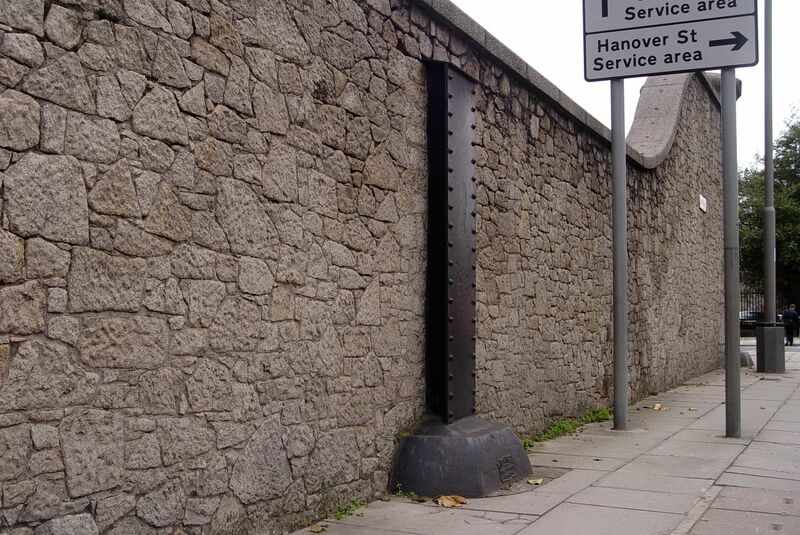 They were all left to rot and could have been filled in and obliterated several times in the 1970s. In fact, it seems possible that only the city’s growing poverty saved them. Well they’re here and it’s been great to look around. They didn’t all survive though, so I’ll be back soon with the story of one glorious place we lost. Most of the photographs are by me, but obviously in such a historic piece some aren’t. 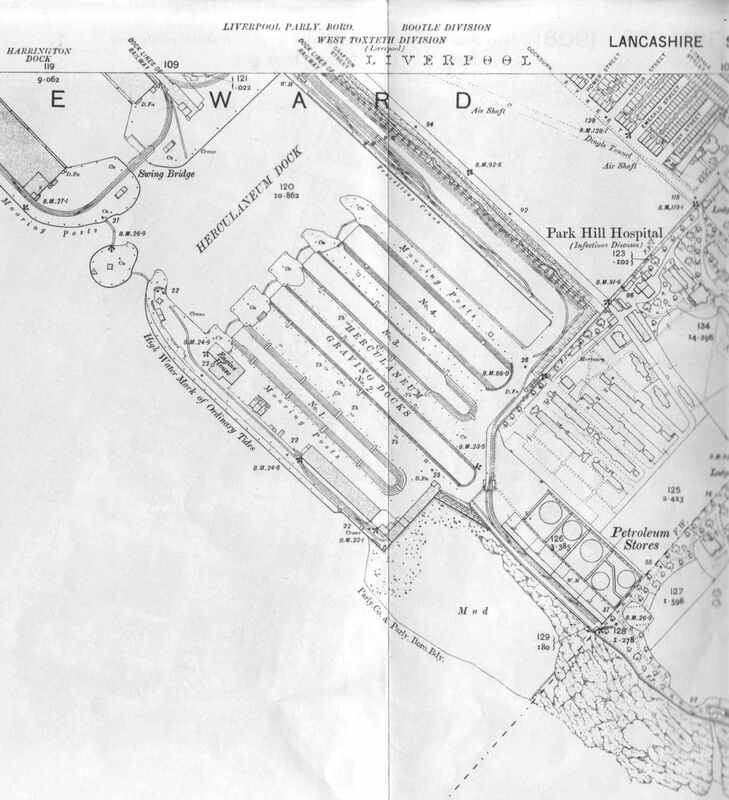 Those of detailed dock workings are from the Mersey Docks and Harbour Board Collection. Aerial photographs are from ‘Liverpool from the air’ by Colin Wilkinson. Maps are from the Ordnance Survey Godfrey Edition. And the other black and white photographs are from one of my most treasured possessions, ‘Seaport’ by Quentin Hughes. More about him in my next post. Yes Robert, typical of a Liverpool docker. Also who was told the daffodils were out and retorted does that mean us as well? But theres so much in this item that I knew and remember so well but it takes a jog now and then to bring it out. 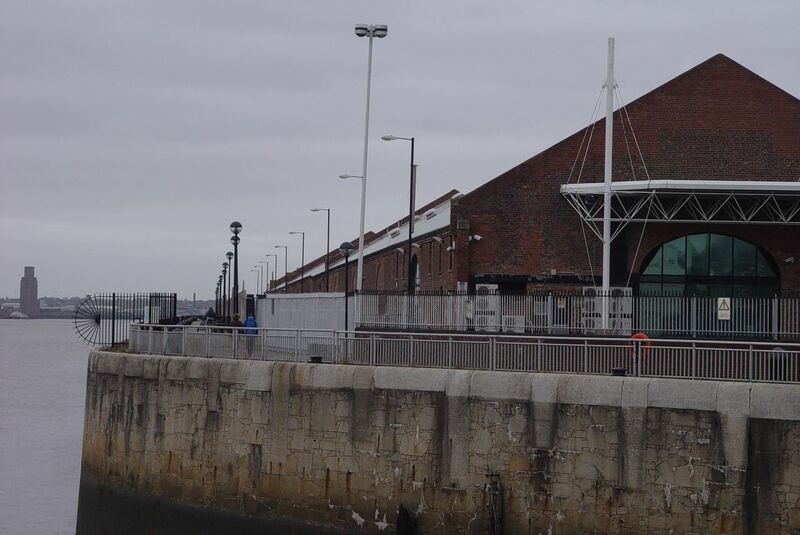 That ironwork on the overhead supports, people walk past without a second thought, the dockers steps, the queens dock, always felt so foreboding to me, almost ghostly. 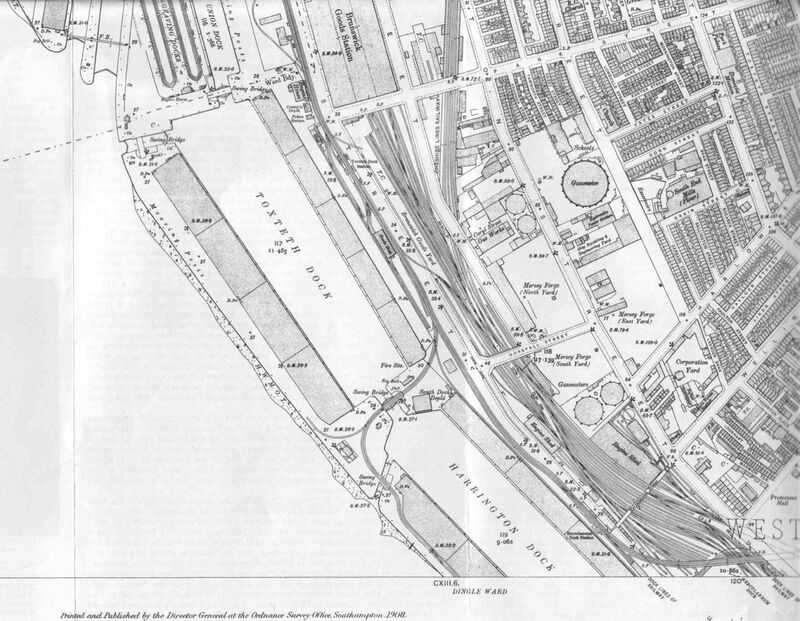 The Wapping Dock where my uncle was the ticket collector on the Overhead. The dockers at the Herculaneum overlooking the Overhead station steps, who threw oranges to me. I had them stuffed up my jumper, in me pockets and anywhere else i could put them, large juicy sweet jaffas. I hadn’t seen things like this in my life. Ronnie, you’ve woken up so much in this shot for me. There’s too much for me to recall all at once but I thank you so much for that. Thank you Stan, this one was such a pleasure and a privilege to write. It’s obvious from your memories that the place is full of stories waiting to be told. 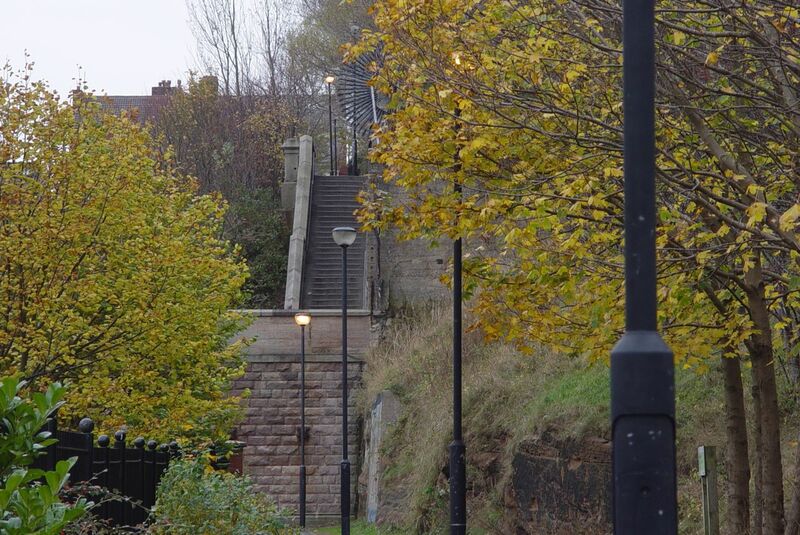 I continue to read your blogs each week promising myself that I must find the time to retrace some of your steps (particularly on the Wirral). This week I have been pleased to see that you have visited a couple of areas that I have already walked on an irregular basis. eg Spike Island / Pickerings Pasture. 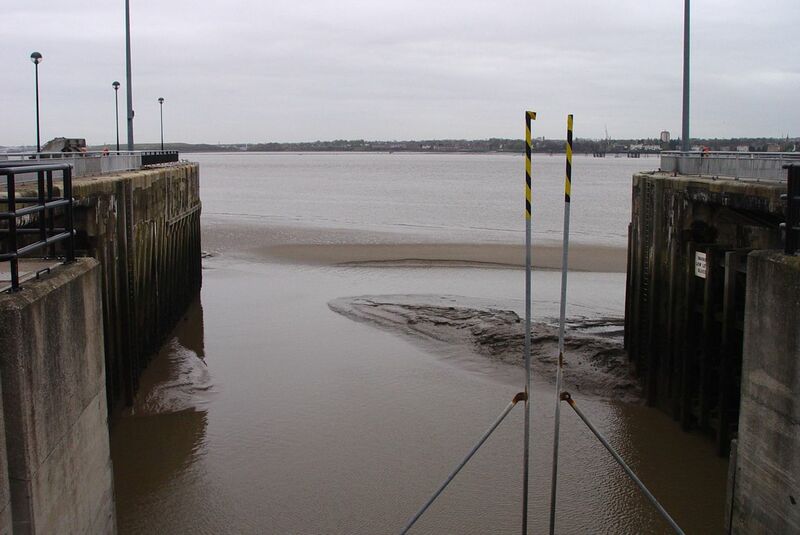 I have been attempting this year to fill in some of the ‘missing’ bits between Widnes & the Pier Head but still have to complete the exercise. Hale Head is always pleasant but found the area around Fiddlers Ferry is getting more & more run down.From Speke Hall, past the Liverpool Sailing club and around the back of the original airport terminal etc down to Garston, although unspectacular in parts, should be on your ‘to do’ list if you haven’t done this already? 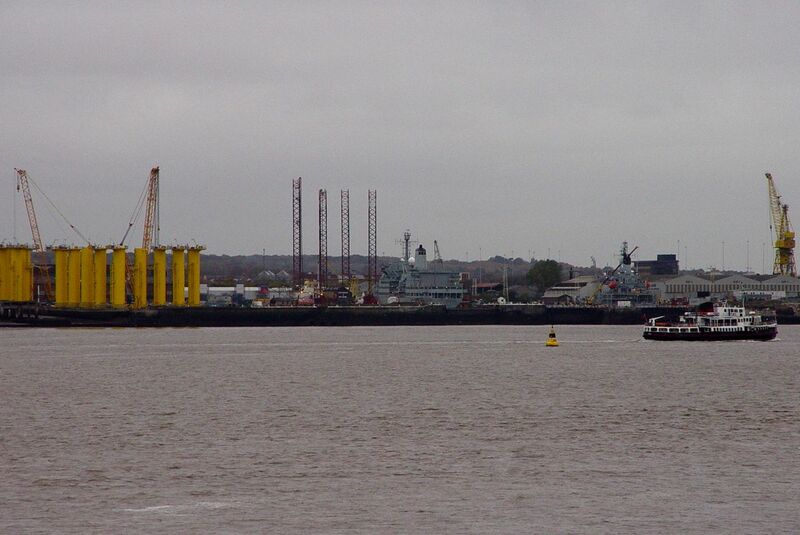 There always seems to be something new to see in the South docks. 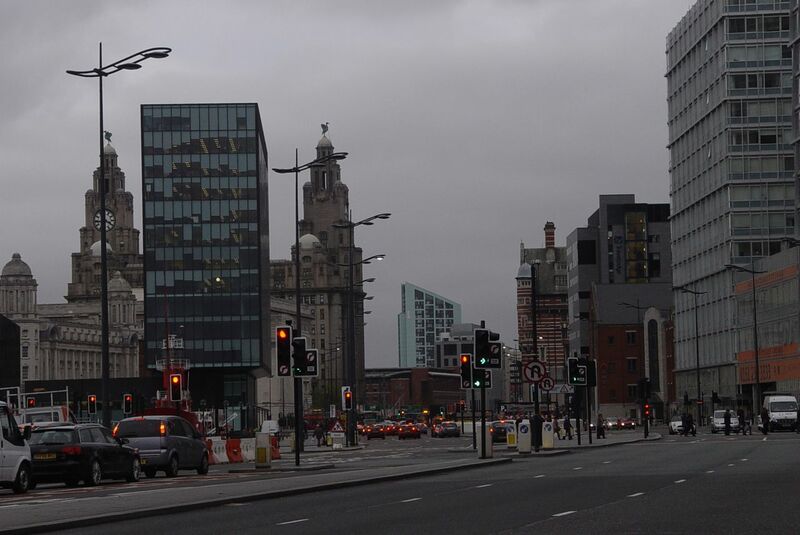 I’ve had a couple of afternoons there this year recalling times spent there in the late 70’s when the docks were tidal. Nice to see some of the older b/w shots of them. ps Keep up the good work with your blog! 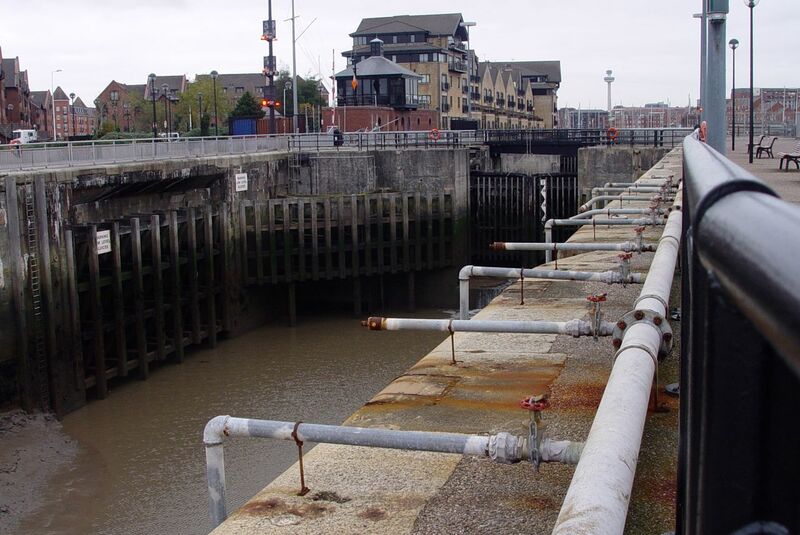 I too remember the South docks when they were tidal, how quickly everything silted up and how run down it all looked just as they were starting to clean it up early in the 80s. 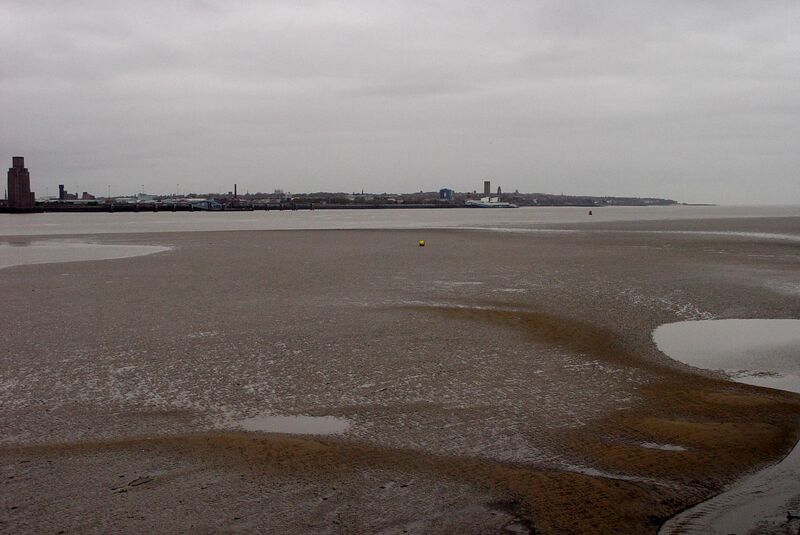 Enjoy the Wirral walks when you get there. 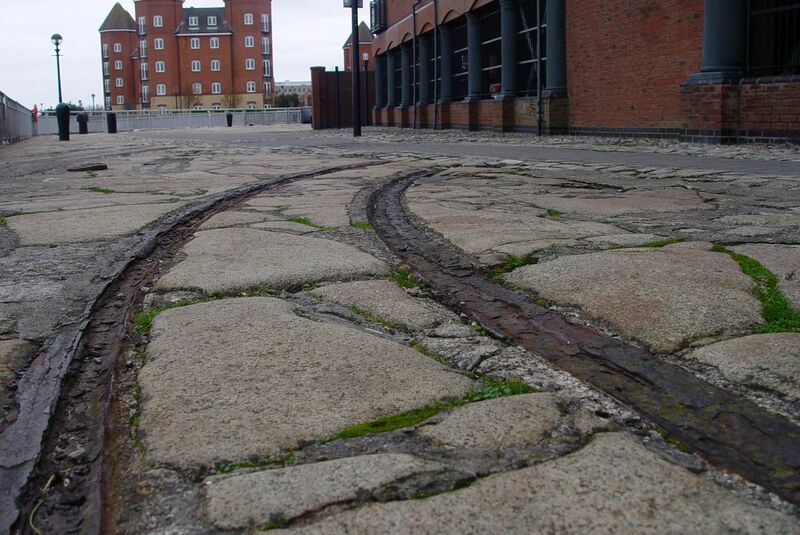 Just a quick thanks for these two articles – I love the historic walks, and weren’t those embedded tramlines beautifully rusted? Lovely photos and comments. My Dad was a watcher, (Customs) on Coburg dock until his death in 1974. I worked for various shipping companies as a teenager. I was the purchasing officer for stationery and purser’s office for Nigerian National Line during the mid sixties and often had to visit places to take orders to: ships’ chandlers were mainly around Paradise St near the Victoria monument, G. J. Poore’s for the medical chest, flags, bills of lading and other documents etc from printers’ offices like James Laver off Water street. The streets were full of office lads and girls on their way to the Custom house and the shipping offices. It was really a hive of industry and and when I worked in Hong Kong that place reminded me of what Liverpool must have been like in its hey day . Full of life and very wealthy with beautiful buildings going up almost daily and a fierce pride in the city. It’s still a beautiful city if the buildings are still standing . 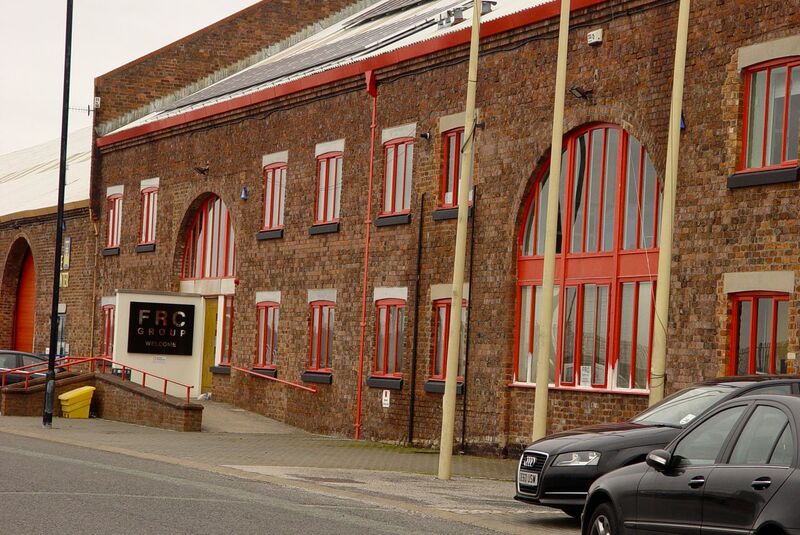 I miss all the central buildings around St Anne STreet etc and SCotland road though. I live in Durham but will back in Liverpool on Monday 2nd Nov. for the funeral of Brian Ferguson, great banjo player, wit and craftsman, and the onetime proprietor with his wife Irene, of the Green Moose Cafe in School Lane in the 60’s and 70’s. He was a lovely guy Many of Liverpool’s creative people hung out there during the 60’s. People like Willy Russel and many fine poets and musicians. 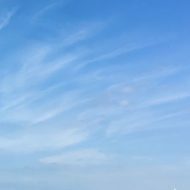 His own daughter became a yacht master after visiting the tall ships anchored in Liverpool with Brian in the 0′ or was it the 90’s? THanks so much. Will follow your blog. Patty O’Boyle, (Bleasdale) ex Belle Vale prefabs.